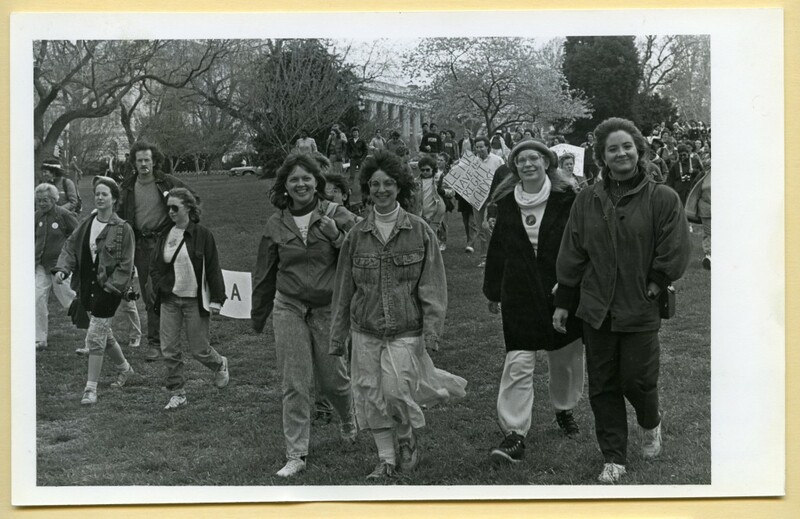 In celebration of Women’s History Month, the University Archives presents selections from our collection that highlight Chatham’s unwavering commitment to encouraging civic engagement in all levels of the political system. 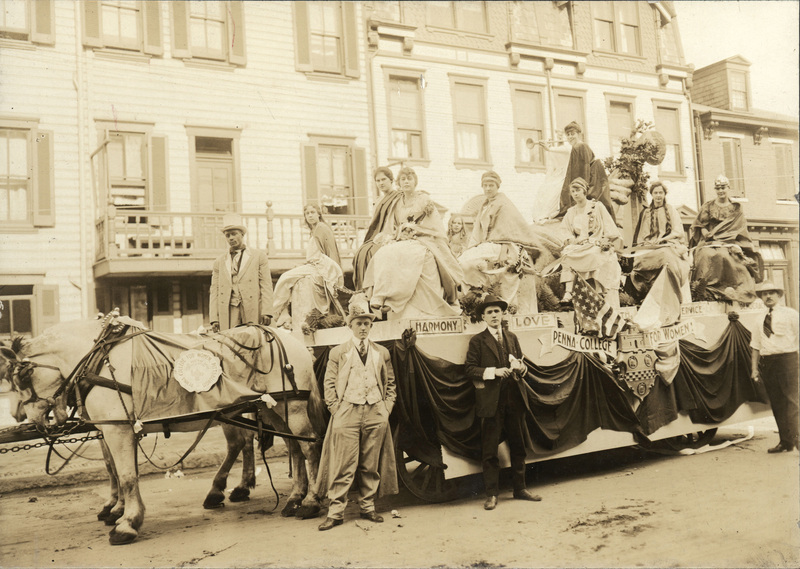 This exhibition, Celebrating Women’s History: Chatham Women in Politics, demonstrates student civic engagement tracing back to the earliest days of the Suffragette movement, when students paraded through downtown Pittsburgh in support of women’s right to vote. 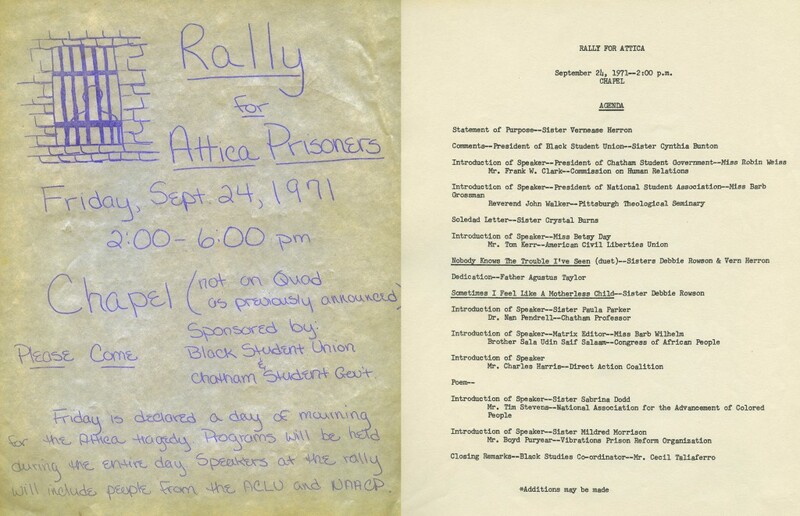 Materials on exhibit illustrate a wide variety of activities, including rallies supporting equal access to education and student involvement in all levels of the political process. The exhibit illustrates the continuity of the civic engagement among the student body and the university’s unwavering commitment to foster civic engagement as a core value. We welcome you to explore Celebrating Women’s History: Chatham Women in Politics at the JKM Library and in the lounge of the Women’s Institute. See below for some of our favorite archival records on this topic, plus a few that we just couldn’t squeeze into the display cases! Still hungry for more Chatham history? Click here for more information about the collections in the Chatham University Archives & Special Collections. 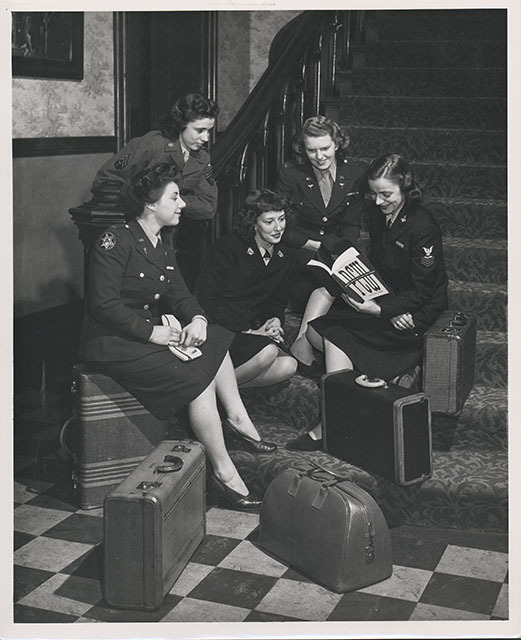 During World War II, Chatham hosted an conference titled, “Women and the War” to discuss the role of women in the war effort. Student volunteers update a poster showing the contributions of Faculty, Seniors, Juniors, Sophomores, and Freshmen to the Fund to fight war and communism. Chatham students worked tirelessly to support the war effort, both at home and on the front lines. World War II veterans return to campus to continue their studies. 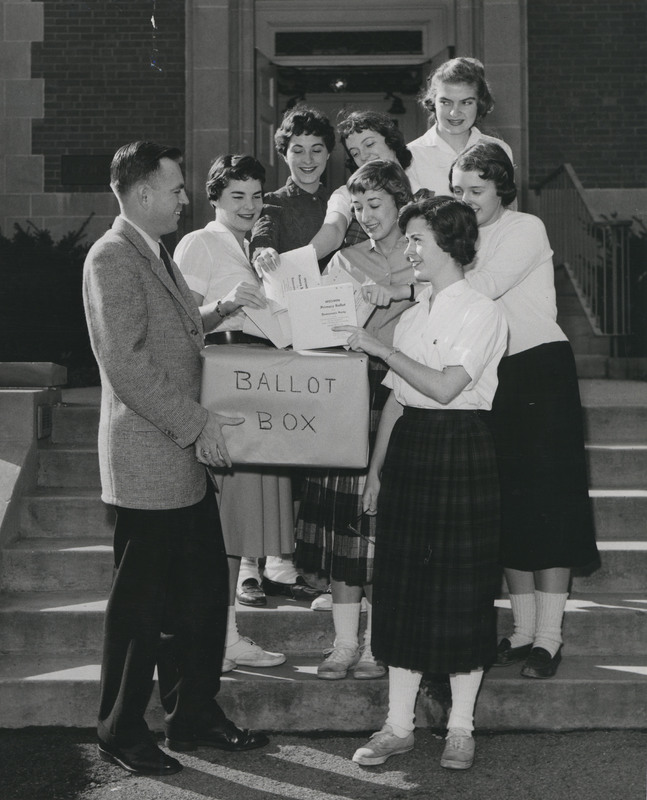 In the 1950s, Chatham students turned their attention to increasing voter turnout, both on campus and within the broader community. Students from Harrisburg cast their absentee ballots. Student-lead efforts to increase voter turnout continue to this day. 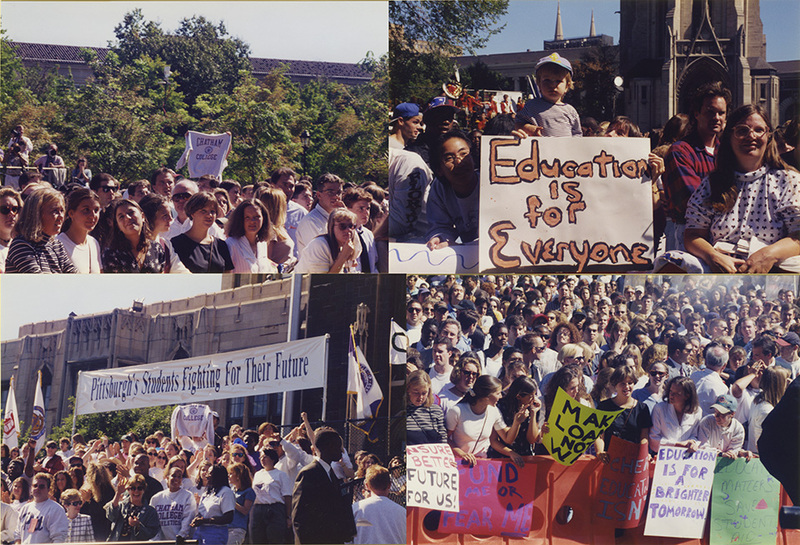 In 1997, Chatham students collaborated with students from the University of Pittsburgh in a program to increase voter registration in the local community. 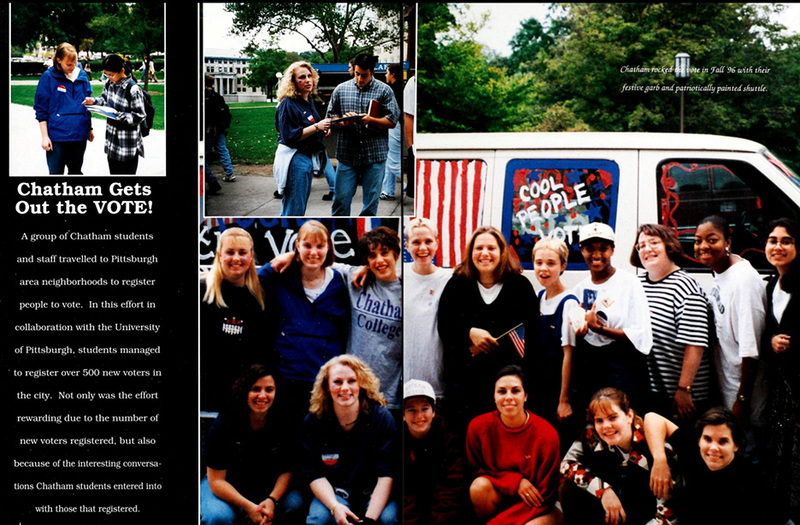 Two-page spread from the 1997 Cornerstone about voter registration efforts. In the 1960s, Chatham women joined in the rising chorus of American students speaking out on issues of civil rights and the war in Vietnam. After the Greensburg Four protested racial segregation at a Woolworth’s lunch counter in North Carolina, students from all over the south joined the sit-in. 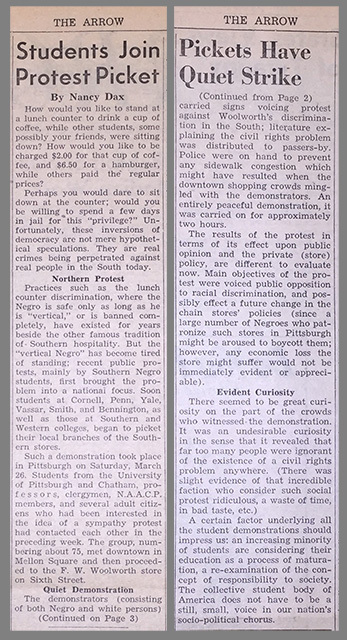 In Pittsburgh, Chatham students protested outside the downtown Pittsburgh Woolworth, carrying signs reading “Chatham students protest civil rights violation,” and “Chatham students protest Woolworth lunch counter segregation.” Click here to view a picture of this protest captured by legendary Pittsburgh photographer Teenie Harris housed at the Carnegie Museum of Art. Read more about the 1960 protest in this clipping from the Chatham student newspaper. All across the country, college students voiced concerns about equality, civil liberties, and civil rights. 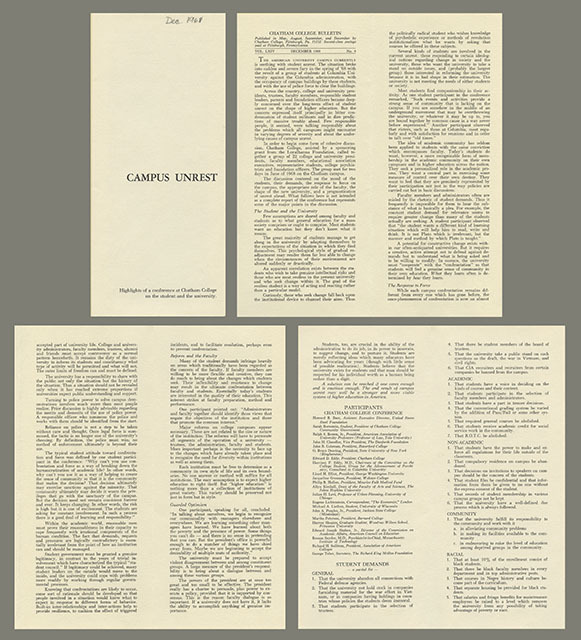 The university hosted a conference focusing on campus unrest in 1968, allowing college and university presidents, faculty, students and administrators to discuss and understand the changing political climate. 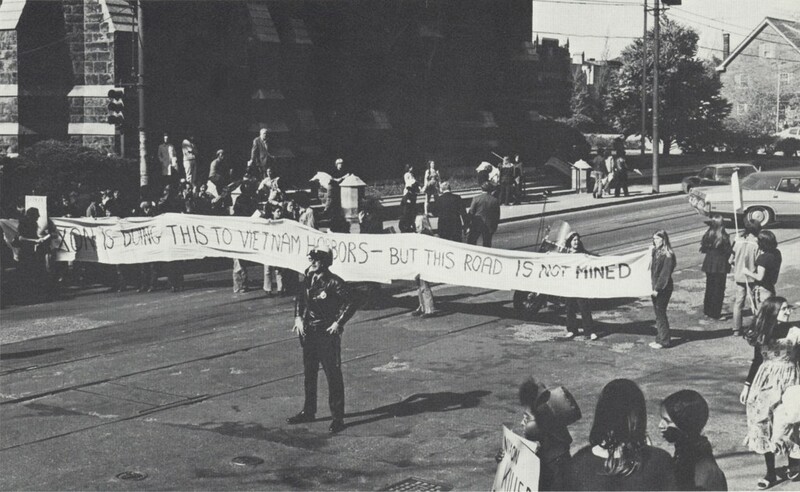 As the 1970s drew near, Chatham students became very engaged in discussion of the Vietnam War and continued to the support civil rights issues. 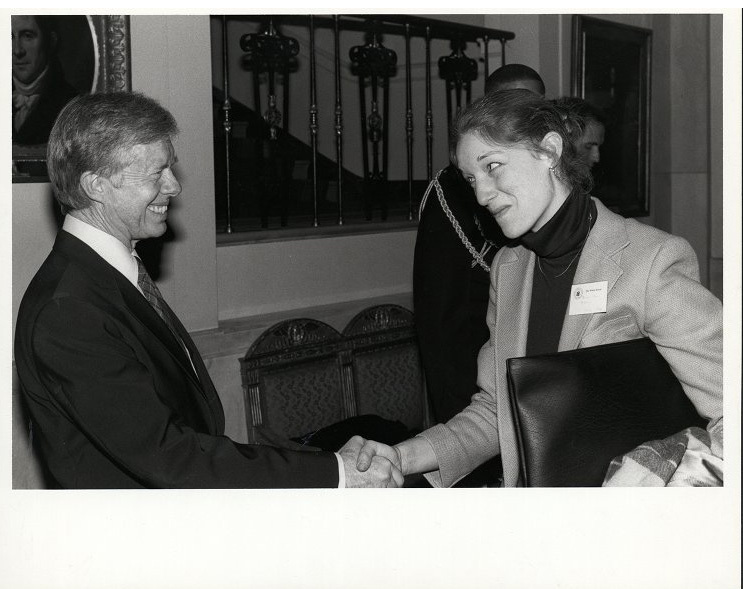 Student civic engagement continued through the 1980s, when Chatham women participated in demonstrations in Pittsburgh and Washington, D.C. One student attended a meeting at the White House with student leaders and President Jimmy Carter. In 1995, Chatham students organized a rally in support of Vice President Al Gore’s campaign to preserve federal funding for student loans. The rally was attended by over 2500 students from local colleges and universities and at least one University President. Can you spot the University President in the pictures from the event below? Over the years, Chatham has invited activists, heads of state, members of Congress, and other office holders to engage with students on local, national, and international political issues. Curious about Patricia Schroeder? Here’s more information about her career and her visit to Chatham. Wondering if Catherine Baker Knoll, who spoke at Chatham as the Treasurer for Pennsylvania, held any other public office in the years that followed? 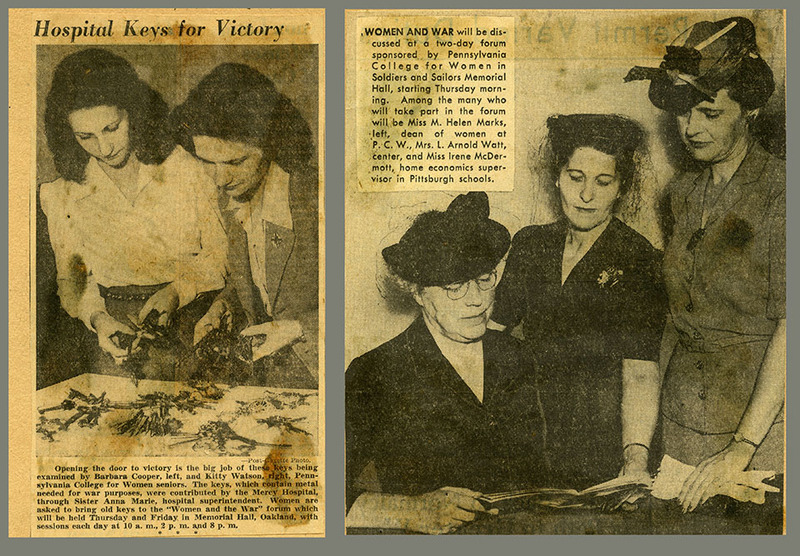 Her records are open for research at the Detre Library and Archives at the Heinz History Center in downtown Pittsburgh. Click here for the finding aid to her papers. 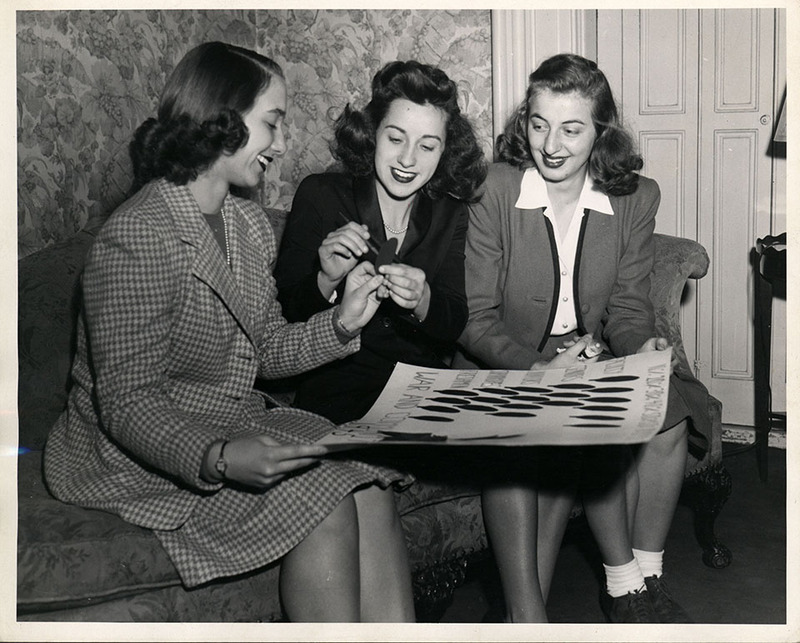 Remember, the Chatham University Archives can help you locate primary source records at other archival repositories. Of course, we’re all looking forward to the 2016 commencement speaker, Chatham’s own Muriel Bowser. 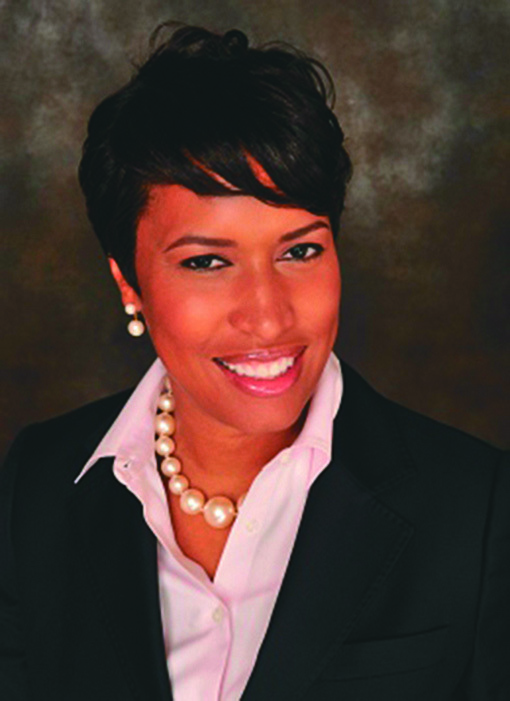 Muriel Bowser graduated from Chatham in 1994 and was the eighth Mayor of Washington, D.C.
As much as we’ve shown through Celebrating Women’s History: Chatham Women in Politics, we have so much more material in the University Archives that documents Chatham’s unwavering commitment to encouraging civic engagement among students. We’d be thrilled to show you more from our collections on this or any other area of Chatham history. For more information about our collections and how to contact us, click here.